You Break Them - I Fix Them! Accidents do happen, parts may wear or crack, no worries I handle all types of repairs! 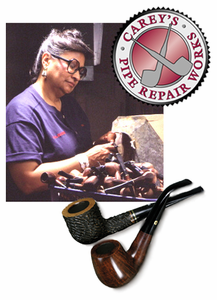 Repairing pipes is my passion and you can feel rest assured I handle each and every repair as if it was very own favorite smoking pipe. Frequently I am asked if I have my prices on my web site. It is difficult to post prices because each repair, although similar, has it's own uniqueness with materials, age of pipe, logo's etc. Please, if you have any questions, contact contact me via e-mail at mak11@ptd.net. Q. Which is more durable, Vulcanite or Lucite? Q. Can you remove the oxidation from a vulcanite stem? Q. What does reconditioning consist of you doing? Q. Can I replace the tenon? Q. Can you remove clogs in pipe/stems? Q. Do you band shanks? Q. The shank broke in half, what can I do? Q. Do you do logos? Q. I want my pipe to look newer, what can be done? Q. Do you have BakeLite Stems? Q. Do you have twin bores? Q. Do you replace meerschaum bowl and recork calabash bowls? Q. Can you fix a hole in the bowl? Q. Can I convert my metal screw filter to a push pull fitting? Q. The stem in my Kaywoodie is over turned, can it be made to line up with the shank? Q. My pipe fits into a box. Can you make the stem fit the box?